After soaking the shirts in soda ash prior to staining, can I rinse and dry, then stain? Message: This is my first time tye dying and it’s for my husbands 40th 70’s themed birthday party. After soaking the shirts in soda ash prior to staining, can I rinse and dry, then stain? Or do they have to be wet? Contains premeasured Procion dyes in 3 colors. Kit includes soda ash presoak to fix the dye. Do not rinse out the soda ash before applying the dye! The soda ash must be in the shirt at the same time as the dye. It does not matter whether you let the soda ash dry in the shirt before applying the dye, as long as you do not wash it out first. Note that soda ash works only for fiber reactive dyes, such as Procion MX dyes. It will not make other types of dye, such as Rit all-purpose dye, more permanent. 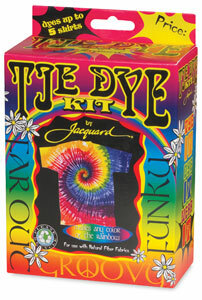 It is important to choose a good dye for tie-dyeing. (See my page, How to Tie Dye.) The dye included in tie-dyeing kits almost always works very well. Be sure the shirts you are dyeing are made of 100% cotton. If they contain polyester, the colors will be pale. This entry was posted in soda ash, tie-dyeing on December 8, 2014 by pburch.